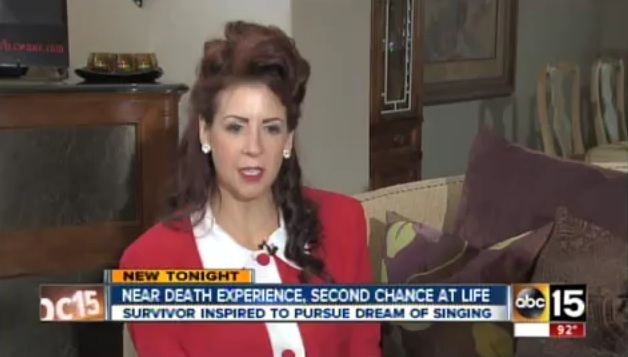 Visions of Jesus Christ.com - Valley woman, Serenity Stewart, says near death experience changed the course of her life. “I'm lying in the hospital bed. I was up above looking down on myself. There's a couple of people up there, but I really couldn't identify them. It was like you know them and they’re there to help you. You feel very safe, but they were telling me to go back,” Stewart said..
[Watch/view] Serenity talk about her Near death experience at the 0:52 second mark. September 30, 2012 Reported [here]. 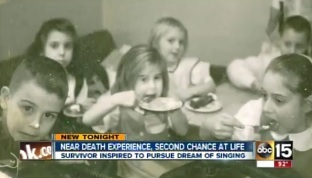 Phoenix Arizona - Ever since she was a little girl, Serenity Stewart dreamed of being a star. But, life got in the way and those big dreams continued to be just that, a dream. “It's so easy to get caught up in all of this out here and you forget about all of this in (your heart),” said Stewart. But, suddenly, the idea of death became a reality she was forced to face. Blood started filling her facial cavity inside her head and ears. “I was writing a will because I still had young ones at home,” Stewart said. “I'm lying in the hospital bed. I was up above looking down on myself. There's a couple of people up there, but I really couldn't identify them. It was like you know them and they’re there to help you. You feel very safe, but they were telling me to go back,” Stewart said. She went back to a life that had been extremely challenging for this single mother of four. Wow, someone was really pulling me in a different direction,” Stewart said. Now, an empty-nester, she decided to spend a year healing both physically and emotionally. “I went deep sea fishing. I sailed. I went from San Diego to Cabo to Puerto Vallarta. I think there comes a time when you say I'm important too," said Stewart. So, she started a new career as a singer and songwriter, something that was born out of a near death experience. It’s a second chance to turn her dreams into something real. Visit Serenity Stewart's [website].